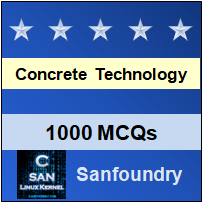 This set of Concrete Technology Multiple Choice Questions & Answers (MCQs) focuses on “Types of Cement”. 1. Which chemical compostion has highest content in OPC? 5. Which compound gives the colour to the cement? Explanation: Iron oxide pigments are in the form of particles ranging approximately from 0.1 to 1.0 micron. The difference in color between one pigment and another is due to the shape and surface structure of the particle. 6. Which cement contains high percentage of C3S and less percentage of C2S? Explanation: This cement contains high percentage of C3S and less percentage of C3S. This is infact high early strength cement. 7. When concrete is to be laid under water, ____ is to used. Explanation: When concrete is to be laid under water, quick setting cement is to used. This cement is manufactured by adding small percentage of aluminum sulphate (Al2SO4) which accelerates the setting action. 8. Which of the following is correct for Low Heat Cement? d) This cement contains high aluminate %age usually between 35-55%. Explanation: In this cement the heat of hydration is reduced by tri calcium aluminate content. It contains less percentage of lime than ordinary port land cement. It is used for mass concrete works such as dams etc. 9. What is the percentage of iron oxide in white cement? Explanation: As iron oxide gives the grey colour to cement, it is therefore necessary for white cement to keep the content of iron oxide as low as possible. 10. What is the percentage of air by volume in Air Entraining Cement? Explanation: Entertainment of air also improves work ability and durability. It is recommended that air contents should be 03-04 % by volume.